Twitter is a great resource for information, useful links, breaking news and status messages from your friends or companies you’re interested in. But if you’re following a lot of streams, it’s not easy to weed out what’s important or relevant to you from the waterfall of short messages that you’re continuously being bombarded with. Enter just-out-of-closed-beta Filttr, a new project from a department of web hosting company Racked Hosting, that aims to enhance your Twitter experience with a client that automatically filters content from your followers using an algorithm dubbed FLAI (Filttr Artificial Intelligence) and offers a slew of additional features which might also come in handy. When you sign up for the service (and yes, you need to enter your Twitter credentials so that’s up to you), Filttr will analyze any data it can find based on your account settings and history in order to determine what you’re most interested in. Once the analysis is done, you’ll be presented with a timeline on a web-based or Adobe AIR powered desktop application (there’s even full support for IM and a mobile site) that essentially filters content Filttr assumes you don’t want to read. Tweets it deems irrelevant are hidden but can still be viewed in a mouse click, and if you feel the FLAI engine doesn’t work as advertised you can still opt to increase a user’s priority on the settings page or by using the arrows when you hover over their icon. My personal experience using the tool comes down to this: although I follow a lot of people, I’ve yet to see a single tweet get “filttr’d” so the logical conclusion is that the algorithm doesn’t work all that well (either that or I’m just interested in everything). The FLAI engine is supposedly self-learning, so the weeding out part should improve the more you use the application. Also, you get to blacklist / whitelist certain keyphrases and other things to enhance the filtering process. Filttr does much more than filtering, though. It’s also a client that you can use to update your Twitter account, upload and share files (pictures only for now), search your own timeline, create groups, view conversation threads, etc. Filttr also auto-updates, so no need to consistently push the refresh button if you’re using the browser version. 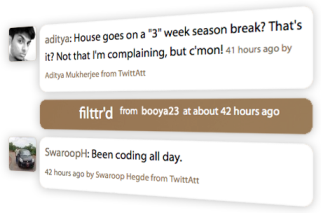 Even if just for the extra features, you should most definitely check out Filttr if you’re a regular Twitter user.